Sets of Winds of Magic Cards, Spell Cards, and Magic Item Cards for the fantasy battle game of Warhammer. Cards look unused. 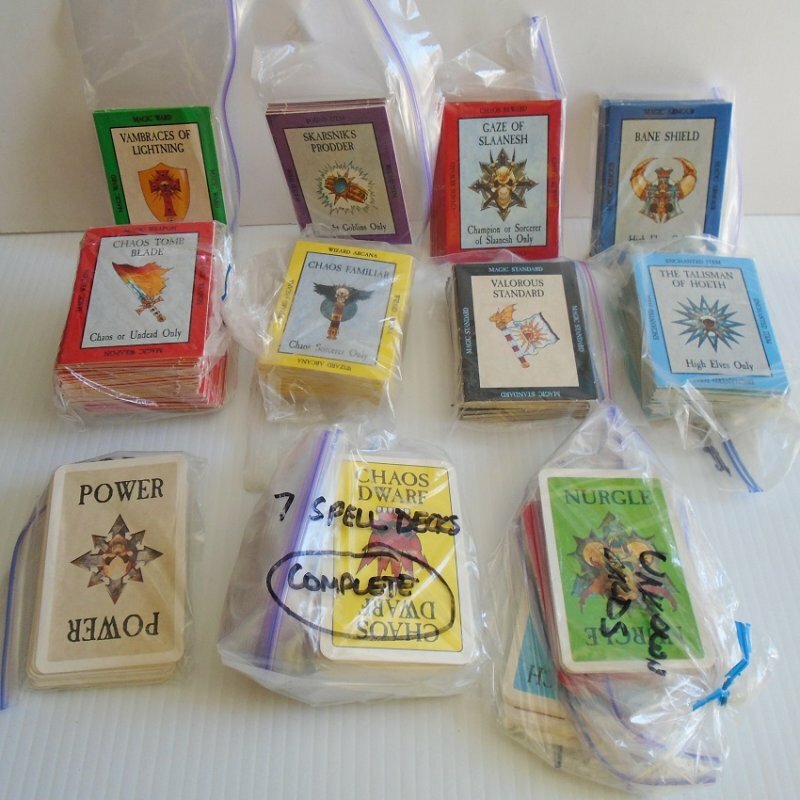 Offered in this listing are sets of Winds of Magic Cards, Spell Cards, and Magic Item Cards. Note that according to the rule book, there are 7 different decks that make up the Magic Item Cards. The total amount of cards for those 7 decks should be 225 cards. Actually, I have 8 decks with a total of 248 cards. I can not figure out what the extra deck is, so consider it a bonus. Also, comparing the cards that I am offering with the listings of cards shown in the rule book, these sets should be complete. The cards are all in beyond excellent condition and even look as if they've never been played with. Quite a few years ago I purchased a storage unit at an auction and in that unit were several good size boxes of Warhammer figurines and accessories. There had to be several hundred figures. I had no idea what these were or what game they belonged to, so I packed them up and they've been sitting in my garage for eight or nine years now. Then, a couple of weeks ago I was out going to yard sales and a fella was selling about a dozen of them. He finally told me what I have. I've spent hours and hours on google since then trying to determine if they have names and what to call them. I will be selling them all in lots of different amounts. But I'm still struggling with what to call them. In my research I see that there are different types of Armies, different types of warriors and fighters, different designs of what they wear when going in to battle. I can't determine their names because it appears that they are 'built" to the player's desire of what they want their Army to look like. So, I'm sure that the titles that I assign to each lot may not make a lot of sense to you buyers, but it's the closest thing I could come up with. I suspect when I get them all listed there will probably be over 100 lots listed, so please be sure to check my other listings. Due to the weight, the shipping cost that I am quoting is for USPS Priority Flat Rate mailing. Shipping is from Arizona so if you live in the western half of the U.S. it may be more cost effect to mail these using regular Priority Mail. Please feel free to send me your zipcode and I can determine the best option for you. If that's inconvenient and you overpay for the shipping I'll refund an appropriate amount. Buyer to pay $9.95 shipping charges, possibly less depending on your proximity to Arizona. International buyers must contact seller for international shipping charges before making a purchase. Seller reserves the right to void any international transactions where contact has not been made prior to purchasing. All items in my listings come from either estate sales, garage sales, or auctions. I do not know if they came from homes where smoking or pets were present. All items are sold in the same condition as when I received them.